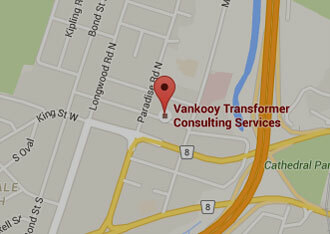 van Kooy Transformer Consulting Services Inc. The Best Place to Buy Your Transformers!!! There is an old axiom that states, when you buy something, you need to consider Price, Quality and Service – pick any two. The presumption is that it is not possible to get all three attributes from one supplier. When defining these criteria from a transformer perspective, we can break down the components in more detail as follows. Obviously, First Cost of the equipment is a primary consideration but selling price must be evaluated together with transformer Losses. Losses have a direct link to the amount of winding conductor, quantity and grade of core steel which in turn impacts the cost. Typically the higher the losses, the lower the cost but of course material is only one part of the equation. Many buyers assign a dollar evaluation to Losses, broken down into $/kW for No- Load Loss and $/kW for Load Loss. No-Load Loss, also known as core loss or iron loss, is related to the grade and amount of core steel used. This loss affects the transformer immediately upon energization and is constant, independent of loading. Load Loss also known a copper loss, varies directly with load. No-Load loss is given a higher $/kW evaluation. Manufacturers will optimize the design around the $/kW values to come up with their lowest Total Evaluated Price, the combination of First Cost + $/kW for each loss component. As a buyer you should always state a loss evaluation $/kW so you can compare apples to apples. A “high loss” design can be 30 % “cheaper” (First Cost) than a “low loss” design. Don’t generically specify a “Low Loss” design as this has no industry recognized meaning and you will get a mix of quoted losses that will be difficult to compare. In general, the cost of a transformer can be broken down into Material, Labour, Overhead, and Transportation. Material Cost includes winding conductor, core steel, oil, tank and support structure steel, and Components including Tapchangers, Bushings, Lightning Arresters, Cooling Equipment, Controls Equipment, CT’s, Gauges, etc. Labour costs are subject to the norms for industrial work in the Country/Region where the Plant is situated and can vary widely, even within North America. Overhead is a catch all for fixed cost including Buildings, Services, Employee Benefits, Salaries for non-line employees, and “Franchise Fees” that multinational branch Plants must pay for Branding, R & D and Technical Support. Also lumped into Overhead are the costs associated Health and Safety and Environmental responsibility which vary dramatically from country to country. Sales Expense or fees paid to Agents or Company salespeople must also be accounted for. Transportation costs can vary greatly dependant on the mode. Rail is less expensive than Truck but transformer size will often dictate mode. If transporting by Rail, the transformer will need to be transported from the nearest rail siding to Site, which adds cost. Typically the cost of transportation is broken out separately. The FOB point will also impact on cost. FOB Plant is less cost/risk for the Manufacturer than FOB Customers Site. Terms of Payment also affect the cost/risk for Buyer and Seller and will vary from advanced payment, through to progress payments, through to payment 30, 60 or 90 days after successful delivery to site. Warranties vary from 12/18 months (the lesser of 12 months in service or 18 months from delivery) to 5 years. Short Term Quality is the easier one to assess. Did the transformer successfully complete factory testing? Testing is divided into Quality Control Tests and Design Verification Tests. Quality Control tests include Oil Quality, Dielectric Tests (Impulse, Applied & Induced Voltage testing), Insulation Resistance and Power Factor. These tests are typically go-no go, with well-defined parameters defined by Standards (ANSI, CSA). Design Verification tests compare the actual tested values for No-Load loss, Load loss, Impedance and Temperature Rise against guaranteed values that formed part of the original quote. It is important to establish a penalty format for losses to ensure that the supplier meets the quoted losses or alternatively compensate the buyer for losses beyond guarantee. Long Term Quality is more difficult to assess since the results of poor quality may take some years to show up. As referred to above, there are National Standards (ANSI, CSA, IEC, etc.) that provide general guidelines for specifying and testing transformers but there are many significant parameters that are left to the Manufacturers discretion. Even in combination with comprehensive Customer Specifications, there are a wide variety of approaches in design and manufacturing methodology that can have an impact on Long Term Quality. The choice of Material and Components will affect cost and quality. Service is another term that is open to interpretation, but I offer the following thoughts from our experience. Let’s look at Service Before the Order is Placed, Service While the Transformer is in Process and Service After the Transformer is Shipped. Service Before the Order is Placed would be the obvious place for a Manufacturer to put their best foot forward. As a buyer, you would send a Request for Quotation (RFQ) to selected Manufacturers or their Agents. Depending on the complexity of the transformer and the Standard Process of the Buyer, this RFQ could be one page or an involved specification. In all cases you would be requesting Price, Losses and Delivery and a date which this information is required by, the RFQ due date. Often a Buyer will also request technical and commercial fill-in sheets to be completed. As a buyer you should be able to easily and quickly compare RFQ’s on whatever parameters you have prioritized and choose the best place to buy your transformer. Service While the Transformer is in Process covers communication and maintaining commitments during Design, Manufacturing and Testing. Service After the Transformer is Shipped (and paid for) is the true test of Manufacturers commitment to Customer Service. Service is in the Eye of the Beholder; Pick what is Important to Your Organization and Monitor Performance for the Present and the Future. Experience List, specific to the Plant, of similar transformers to those being requested. List must show MVA, Voltages, Tapchanger Type, Customer with Contact Name and Phone number. Experience from the same Company but from a different Plant does not apply. For Offshore suppliers, experience with the Customer’s Country Standard (CSA, ANSI, IEC, etc.) is important since there are differences that can impact testing and operation. Obtain the contract dates for all Union agreements (Shop and Office staff) to determine if the end date falls near the expected shipping date of your transformer. Do they have ISO 9000 certification? Which Company provided the certification? ISO certification does not guarantee quality but it does force an organized process that can be easily checked for compliance. As in all Industries and Products, the Transformer Industry has Low Cost Suppliers, Brand Name Suppliers, and those in between. For obvious reasons we cannot categorize specific Suppliers in a Newsletter. Do not presume that all Manufactures are equal even if they meet your specification and the National Standard specification. The best place to buy a transformer is based in part on the type and size of transformer, the criticality of delivery, the buying philosophy of the Customer’s organization and the recent experience (good and bad) of the Customers’ decision makers. What is Important to the Buying Organization? Each organization must decide how much weight will be placed on each of the elements of the Bottom Line. © 2019 Copyright van Kooy Transformer Consulting Services Inc. Web Design by: SmartWebPros.com Inc.